Journalists, feature editors and TV producers are always looking for these and readers love to read them. If you have one to tell you may be able to tell it to a newspaper, magazine or television company for money. You will need to agree to be photographed, filmed or to provide photographs and sign copyright to them when you sell true story. You should not tell the same one to other publications, unless all parties have agreed to syndication rights. This is unusual, though may be negotiated for a top one, though an individual publication may offer you a higher fee for exclusive rights. The list is endless - if you feel yours is newsworthy and of interest to readers then get in touch with them. Editors will buy them if they feel it will help shift more copies. 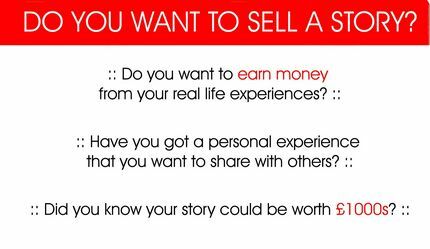 The advantages of selling your real life stories are that you will get 15 minutes of fame and a payment of cash. 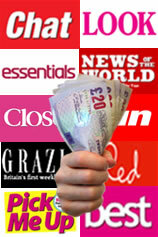 Payments range from £50 to £200 if you contact the editors directly. You should consider going through a specialist website or agency. These agencies can often negotiate a higher fee on your behalf - often in thousands of pounds. I will research such agencies that will help you get yours sold to newspapers, magazines and television programmes and list them on this page. There are some disadvantages of selling your true stories to a publication. You will be thrown into the spotlight - they distribute millions of copies and television programmes can attract even bigger audiences. Yours will be personnel, perhaps even intimate and suddenly many will know lots of details about you. Some may feel they now know you and can approach you where ever you are and discuss things. Some may judge you and offer an opinion that may not be nice to hear. Others may empathise with you and will open up to you about their problems or offer a few words of encouragement. Either way you could make friends or you could lose the friends you already have - especially if they are part it. The payment earned should be declared to your tax office on your self assessment form. I am not sure if it is taxable, but I would recommend informing the inland revenue and the benefits office, etc about the payment. Talk To The Press is run by former journalist Natasha Courtenay-Smith who now uses her many contacts in newspapers and magazines to secure you the best payment. Being a trained journalist with over ten years of experience of working for papers such as The Daily Mail Natasha can use her knowledge to help you get it published in a leading publication and help you get paid for telling it. Natasha estimates that someone could get paid between £200 and £2000 and could even earn £5000 each year if they could tell one each month. 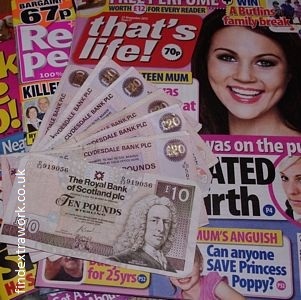 With so many weekly women's magazines available in the UK there is a genuine need for those of interest for their readers and editors are prepared to pay for them and photos. Talktothepress.com considers that almost everyone has one: not just about love and romance but perhaps about their financial difficulties or hospital experiences. Inspirational and uplifting tales are also needed as are heartbreaking ones of how people have coped with difficulties. www.talktothepress.com takes the fear out of approaching the many UK papers and mags and will gently talk you through it, discuss how to sell your story and approach the editors who they know will be interested. This saves you the time, expense and stress of phoning, e-mailing or writing to the hundreds of editors who could be approached to buy it. They will then negotiate your contract and fees with such publications like The Sun, The Mirror, The Daily Mail, Take a Break, Best, Red, Glamour, Real People or Woman. They have the ear of many commissioning editors who are inundated with those sent directly to them and can get it heard much quicker and knows what to tell the editor so that it will not get spiked. Another major reason findextrawork.co.uk suggest using this service is that should you be able to give it to more than one publication then talktothepress can negotiate this and guide you through any legal aspects such as 30 day exclusivity contracts. Talktothepress can also help you secure television appearances on programmes such as This Morning, GMTV, Richard and Judy and other chat shows which offer higher payments. They offer this service free to the person telling it and secure their own payment from the editor who finally publishes it. They are written in house by their staff so you know who you are dealing with and can trust. They can also handle your contract to take the legal headache from you. Those that talktothepress have sold recently on behalf of their clients include the woman who spent £5000 on cosmetic surgery after splitting up with her husband, a man who developed breast cancer and was treated successfully and the secret daughter of a sixties pop star. All the clients of talktothepress.com enjoy seeing their tales in the media and the money that this brings. Some like to donate the money to charity whilst others aims are to bring to the public attention a matter close to their hearts. Others like to just publicly tell their side or tell the public about a crime. Even those who think they do not have one could earn with them by referring a friend who has one. If this is published you will be paid £50. Many of those featured will seem "normal" to many readers. Though editors and journalists are on the look out for a sensational one most of the time they will feature one from those who have problems and events. These sections can often allow you to cash in time and time again – so there is no need to find extra work when you can sell stories every month! The very first step is deciding which one you are going to tell. Famousfeatures.co.uk have found that nearly everyone has experienced something press-worthy in their lives – whether they recognise it or not. These publications are interested in specific one-off events for the context of a magazine, refers to human-interest stories, i.e. : experiences and events that happen to everyday people like you and me. It does not have to be absolutely incredible, amazing, or a completely unique occurrence. Lots can talk about a funny situation they found themselves in, a bad experience, or an unusual lifestyle choice. To inspire others and help them deal with a similar heartbreaking situation. To make money for themselves or a charity. To pay tribute to a cherished friend or relative. To appear in their favourite magazine. To get publicity and raise awareness. To simply share your amazing experience. Although it helps, all too often people think that they have an ‘incredible’ tale, but it’s not what they are looking for. Publications are looking for those about very normal people. In fact, the more normal you are, the more chance you have. Once you have made the decision the easiest way is to send your idea into a press agency (such as www.FamousFeatures.co.uk ). Specialist press agencies supply them to all of the national press, so they are more likely to be able to place it than if you go direct. If it is good, they will also make them bid against each other in order to get you the highest amount. The best part is that you are not obliged until you are happy with the amount being offered and have given the go-ahead. Simply visit Famous Features and fill in their online form. They will get back to you within a couple of days to have a chat and discuss your options if they think it could appear in print. Once you are happy to proceed from there they will approach the nationals in order to get you the most money, or optimum exposure. They will stay in touch with you every step of the way, advising you on the best course of action. Then it’s down to you to decide whether you’ll go for the most money, or you’d rather see yourself in your favourite magazine. www.FamousFeatures.co.uk negotiate with all of the top nationals. These include Take a Break, Love It, Bella, Best, Chat, Fabulous, Closer, Pick Me Up, the Daily Express and The Sun. Stories Wanted provide a personal touch to helping you with UK women's weekly magazines such as Woman's Own or Bella. They can also help you to get into newspapers. It is run by freelance journalist and writer Susan Wallace who, from years of experience and education, knows how to write for magazines and understands what they want. Her website has plenty of information about her services. There is a telephone number, charged at local rates, to contact Susan Wallace. Using her journalist experience and knowledge Susan Wallace can listen and advise you where to best place it. This service is free and using her contacts Susan Wallace can secure you a payment which may be higher than simply sending it direct to a women's weekly magazine. At the time of writing this review her website states between £200 and £1000+ for a unique one.